After the attack on Pearl Harbor, Americans of Japanese ancestry who were of draft age had their status changed from eligible for the draft to enemy alien. This latter designation not only incorrectly labeled them as aliens but also made it impossible for them to serve in the Army (the only branch they had been allowed to join). Many of those already in the Army were either discharged or had their weapons taken away. Hawaii, which was then still a territory and not a state, sent some 1,400 Japanese American soldiers to the mainland in 1942. Most of these soldiers were in the Hawaii National Guard. They formed a new unit, the 100th Battalion when they arrived on the mainland. After a long training period, these men shipped out to North Africa in 1943 and soon experienced heavy fighting in Italy. Because of the many casualties they suffered, they became known as the "Purple Heart Battalion." In early 1943, the War Department decided to form a combat team made up of volunteers from both Hawaii and the mainland concentration camps. The majority of volunteers came from Hawaii although over 1,200 men volunteered from the camps. Interestingly, in the early days of training, the mainland and Hawaii volunteers did not get along. From the top left, recruitment office at Heart Mountain, Wyoming. Young enlistee completes paperwork. Bottom left, volunteers from Topaz, Utah, prepare to board the bus to the train station, bound for basic training at Camp Shelby, Mississippi. National Archives. The unit was designated the 442nd Regimental Combat Team and adopted the Hawaiian crapshooter's slogan of "Go for Broke" as its motto. The 442nd shipped out for Europe in the spring of 1944 where it joined the, by then, battle-hardened 100th Battalion. The 442nd initially fought the Germans in Italy. It engaged in some of its heaviest fighting liberating the French towns of Bruyeres, Belmont and Biffontaine. Soon after, the unit was called in to rescue the "Lost Battalion"—an Army unit from Texas which was trapped behind enemy lines for several weeks. 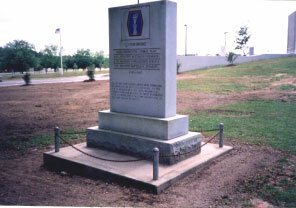 Here the 442nd suffered some 800 casualties to rescue 211 Texans. Some of the unit, including, Daniel Inouye, felt that they were treated as expendable "cannon fodder." Photos on this page, top, members of the 442nd Regimental Combat Team during basic training at Camp Shelby, Mississippi, above left, the 232nd engineers watch an amphibious training exercise on the banks of the Leaf River, above, building a pontoon bridge. Immediate left, the 442nd RCT and the 100th Battalion, were some of the most documented and photographed units of World War II. National Archives. The unit was designated the 442nd Regimental Combat Team and adopted the Hawaiian crapshooter's slogan of "Go for Broke" as its motto. The 442nd shipped out for Europe in the spring of 1944 where it joined the, by then, battle-hardened 100th Battalion. The 442nd initially fought the Germans in Italy. It engaged in some of its heaviest fighting liberating the French towns of Bruyeres, Belmont and Biffontaine. Soon after, the unit was called in to rescue the "Lost Battalion"—an American infantry regiment from Texas American who were trapped behind enemy lines for several weeks. Here the 442nd suffered some 800 casualties to rescue 211 Texans. Some of the unit, including, Daniel Inouye, felt that they were treated as expendable "cannon fodder." Toward the end of the war in Europe, a unit of the 442nd Regimental Combat Team, the 522nd Field Artillery Battalion was separated from the rest of the 442nd. While chasing the rapidly retreating Germans, the 522nd passed through an elaborate system of concentration camps and sub-camps known as Dachau and aided thousands of starving survivors. What was ironic was the fact that many of these men who were liberating others had been themselves imprisoned. 442nd training at Camp Shelby. The men would soon ship out for Europe, where they would participate in some of the most intense fighting of the war. They fought in eight major campaigns including the battles at Anzio, Rome- Arno, and Bruyeres-Biffontaine. National Archives. 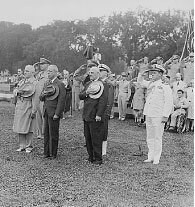 On July 15, 1946, President Harry S. Truman, himself a veteran of WW I, a long with top Military representatives reviewed the 442nd RCT troops at a special ceremony in Washington, DC National Archives. 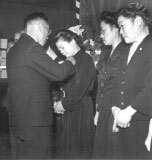 Japanese Americans also served in the Pacific in the Military Intelligence Service (MIS). Much less is known about the exploits of these some 6000 men and 51 women linguists or language specialists. After intensive training, these soldiers were sent in small detachments to units throughout the Pacific not only with U.S. forces but other allied countries as well. They proved invaluable as translators, interrogators, war crime trial interpreters, and writers of propaganda. Ultimately, their language school developed into the world famous Defense Language Institute at the Presidio of Monterey. Three of the buildings on the campus are named after Japanese American MIS linguists. By the end of the war, the 442nd Regimental Combat Team was hailed as the most decorated unit for its size and length of service in American military history. Eventually, twenty-one members of the combat team were awarded the Medal of Honor, but only one during World War II. In 2000, after an extensive review of medals, citations and awards given to minority soliders, twenty additional members of the 442nd received the Medal of Honor for bravery and service to their country. The outstanding record of the unit made it easier for Japanese Americans to be accepted by American society after the war and also, to obtain an apology from the American government in 1988. President Harry Truman told the unit "You fought not only the enemy but you fought prejudice—and you have won." The impact of so many young men and women away serving in the Armed Forces is a new area of research in Asian American studies. However, it is known that many Issei parents and younger siblings missed those away serving overseas very much — as evidenced by these photos from the National Archives. Left, Parents and siblings did what they could to help out the war effort including purchasing war bonds and staffing camp USO's like this one at Heart Mountain. The USO's welcomed the GI's who came to visit their families before shipping out. Above, the Memorial Day ceremony at Amache in 1944, to honor the young men killed in action. Far right, these were some of the Gold Star mothers, when a family's son was killed in action, the military came and gave the mother his medals and a "Gold Star" to signify the family's loss. National Archives. 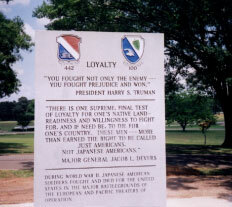 In 1995, Japanese American veterans dedicated a marker commemorating the 442nd RCT at the Mississippi Armed Forces Museum, Camp Shelby. A monument has also been dedicated in Little Tokyo, Los Angeles, California. 1943 Photo of Camp Shelby, National Archives, 442nd marker photos from Mississippi Armed Forces Museum at Camp Shelby. There are very few books on the topic of Japanese Americans in the military for younger students. However, new material is being published all the time and there may be more books available in the future. Cooper, Michael L. (2000) Fighting For Honor: Japanese Americans and World War II, Houghton Mifflin, ISBN: 0395913756. This book is meant for sixth grade and up. Cooper describes the military contributions of Japanese American soldiers during World War II. There are some strong images and descriptions of military action that may make this book unsuitable for younger children. McGowen, Tom (1995) Go For Broke, Japanese Americans in World War II, Franklin Watts, ISBN: 0531201953. McGowen describes the military service of the 442nd and 100th Battalion for children. Reading level is 5th grade and up. Uchida, Yoshiko (1996) Journey Home, Scott Foresman, ASIN: 0663592194. Uchida's book, the sequel to Journey to Topaz, is actually about resettlement. However, college aged, older brother Ken does come home as an army veteran. He has a difficult time adjusting back to civilian life in a changed America — which is described in a manner that young readers can understand. Reading level is 4th grade and up. Books for older students and researchers: There has been tremendous interest in the last few years on Japanese Americans in the military, resulting in many new books, research projects and films. This is a cross section of available material. Asahina, Robert (2006) Just Americans: How Japanese Americans won a War at Home and Abroad, Gotham, ISBN-10: 1592401988. This book focuses on the combat units. The independent 100th Battalion was formed in Hawaii, the 442d Regimental Combat Team had soldiers from both Hawaii and on the mainland detention camps, and the two units' different backgrounds and experiences made for a good deal of rivalry and ill feeling at first. In time they merged and, exhibiting formidable mastery of infantry combat, compiled a combat record in Italy and France that for a unit of its size, remains unequalled. Chang, Thelma (1991) I Can Never Forget: Men of the 100th/442nd, SIGI Productions, ISBN: 0963022806. This book does include black and white photos of the units. Crost, Lyn (1994) Honor by Fire: Japanese Americans at War in Europe and the Pacific, Presidio Press ASIN: 0891415211. Crost writes about the 442nd RCT and 100th Battalion as well as the MIS units in the Pacific theatre. Duus, Masayo Umezawa (1987) Unlikely Liberators: The Men of the 100th and 442nd. University of Hawaii Press, ISBN: 0824810813. This book focuses more on Hawaii's 100th Battalion but does talk about the 442nd RCT. Hawaii Nikkei History Board (1999) Japanese Eyes, American Heart, University of Hawaii Press, ISBN: 0824821440. Compiled and edited by the Hawaii Nikkei History Board staff, this book presents the oral histories of 54 contributors, including the recollections of many Nisei veterans of the 100th Battalion. There are also stories about life on the Hawaiian home front, and first hand accounts of the bombing of Pearl Harbor. There is a roll call of WW II soldiers of Americans of Japanese ancestry. Ichinokuchi, Tad (1988) John Aiso and the M.I.S. : Japanese-American Soldiers in the Military Intelligence Service, World War II. Los Angeles: Military Intelligence Service Club of Southern California. McNaughton, James, Nisei Linguists: Japanese Americans in the Military Intelligence Service During World War II (2007) U.S. Army Center of Military History Publisher, ISBN: 0160729572. This is a story of second-generation Japanese Americans (Nisei) who served as interpreters and translators in World War II. Describes how the War Department recruited soldiers from an ethnic minority and trained them in a secret school to use the Japanese language. Moore, L. Brenda, Serving Our Country: Japanese American Women in the Military during World War II (2003) Rutgers University Press, ISBN: 0813532787. Through in-depth interviews with surviving Nisei women who served, Brenda L. Moore provides fascinating firsthand accounts of their experiences. Interested primarily in shedding light on the experiences of Nisei women during the war, the author argues for the relevance of these experiences to larger questions of American race relations and views on gender and their intersections, particularly in the country's highly charged wartime atmosphere. Steidl, Franz (new edition 2001) Lost battalions: Going for Broke in the Visages, autumn 1944. Presidio Press, ISBN-10: 0891417273. Although this book is not specifically about the Nisei, it covers their participation in the campaign that would make their regiment the most decorated unit in American history. In the fall of 1944, the Allies were driving hard and the Germans were falling back on all fronts. A stand was made by the Germans in the rugged terrain of the Vosges Mountains, where fighting was bitter and intense. The Nisei are not examined in a vacuum, but in conjunction with the actions of other units, both American and German. Much of the book is based on official reports and thus confusing to follow, yet it has numerous personal letters, citations for valor, and interviews that bring the participants to life. Tanaka, Chester (1997) Go For Broke, Presidio Press, ASIN: 0891416307. This reprint edition, which is available at some libraries and through www.asianamericanbooks.com, is a pictorial history of the 442nd RCT and 100th Battalion. Tanaka was a veteran of the 442nd RCT and has included some stunning photos along with his text. Uyeda, Clifford, editor, and the MIS Association of Northern California (1992) Pacific War and Peace: Americans of Japanese Ancestry in Military Intelligence Service 1941 — 1952. National Japanese American Historical Society, ISBN: 1881506029. This book may be available through the National Japanese American Historical Society (see Websites below) or through rare and hard to find book sites like alibris.com. Yenne, Bill (2007) Rising Sons: The Japanese American GIs Who Fought for the United States in World War II. Thomas Dunne Books ISBN-10: 0312354649. More than 21,000 Japanese-American men and women volunteered for service in the U.S. armed forces in World War II, with more than 9,000 receiving Purple Hearts and 21 holding the Medal of Honor, the highest U.S. decoration for bravery. Yenne shows that many were patriots, who put duty above grievance while wondering if the country whose uniform they wore would ever accept them again. Beyond Barbed Wire, Terry De Bono and Steve Rosen (1996) available from Amazon.com. Veterans of the 442nd/100th Battalion and MIS units describe their experiences as soldiers during some of the bloodiest campaigns of World War II. (57 minutes) Now available on DVD with a bonus feature, the original 1951 Hollywood film, Go For Broke, starring Van Johnson, Warner Anderson, and many Japanese American veterans playing themselves (97 minutes.) A good contrast between real history and the Hollywood version. May contain content that is not suitable for young viewers. Available from Amazon.com. Japanese American Veterans Association www.javadc.org is an umbrella website with links to many other sites on Japanese American veterans, veterans issues, and history. 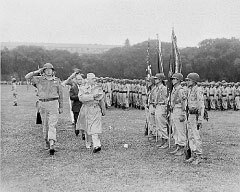 Japanese American War Veterans Website, www.ajawarvets.com lists over 21,000 veterans and their units during World War II. 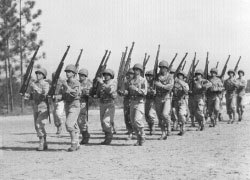 www.katonk.com is a website that includes historical background on the 442nd and 100th Battalion as well as other units that Japanese Americans served in. Be sure to check out the links menu. Go For Broke Education Foundation, www.goforbroke.org is an excellent resource for educators. There are video oral histories of some of the veterans as well as some downloadable video suitable for the classroom. Check out the links. Japanese American National Museum, located in Los Angeles and the repository of a great deal of archival material on the Japanese American experience in the UnitedStates. www.janm.org War Relocation Authority Photographs of Japanese American Evacuation and Resettlement at the Bancroft Library, UC Berkeley www.oac.cdlib.org Type "Bancroft library WRA" in the search window and this will lead you to the online collection. This is one of two large digital collections of War Relocation Authority photographs that are part of the National Archives (www.archives.gov) They have many of the same photographs though the National Archives collection is more comprehensive. The large majority of photos in both collections have been digitized and are available on-line. To find photos of the 442nd training at Camp Shelby, type "Mississippi" in the key word window. 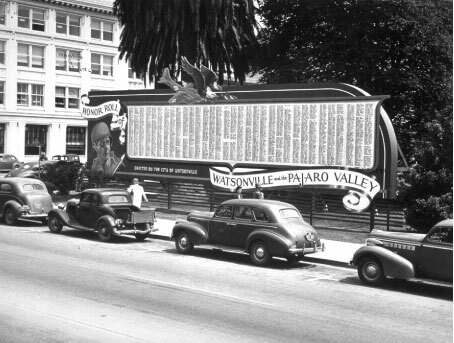 The City of Watsonville's Honor Roll billboard, listing all the area's men and women in the service in 1945. The Honor Roll was placed downtown. In 1943, Watsonville was a rural town with only about 4,000 residents. Over 200 Japanese Americans from this small town in California's Central Coast were serving in the military. National Archives.